At Starfish Signs, our turnkey project management approach to signage and branding ensures that your signage project will be professionally managed by our team. 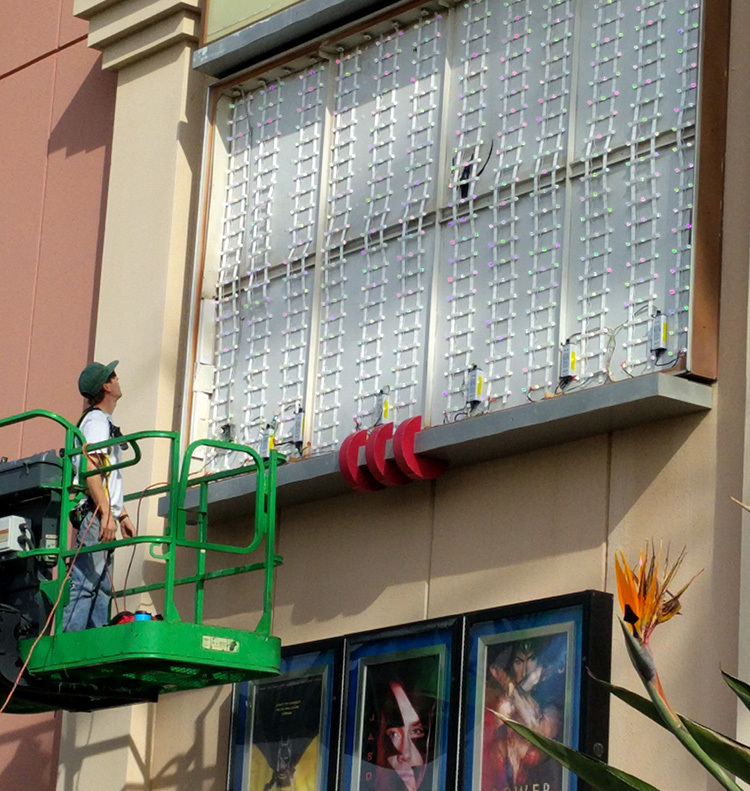 Turnkey management means that we handle every aspect of the signage process with you or for you, from discussing and refining your vision, to researching materials and permitting, to designing, producing and installing your new sign. Our expertise in all phases of project management and custom sign fabrication allows you to proceed with confidence, knowing that our experienced team is here to handle any challenges that might arise. 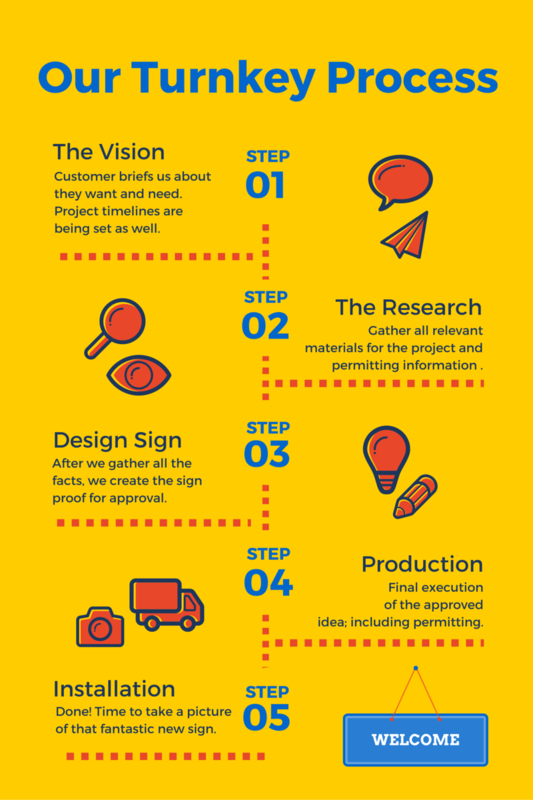 We invest the time with you to ensure that we fully understand all of your requirements for the project – your sign branding and presentation, timeline, and budget – being just a few. Based on this discussion, we provide an estimate of the total investment (link to Consultation and Estimates page) and a project timeline. And where needed, we can help you assess the ROI for various signage and branding options. Before diving into the design process, we gather all the relevant materials and regulations that apply to this project, including design files, brand standards, building owner or property management sign requirements, permitting information (link to Sign Permitting page), and City or other government regulations (link to Americans with Disabilities ADA Compliance page). Once we’ve gathered all of your inputs, and completed all of our research, we prepare detailed renderings, proofs, and where needed, shop drawings, to demonstrate compliance with your vision, and all applicable requirements. These drawings then also become the basis for approvals by property managers, and for City permit applications. After the project proof is approved and permits obtained (if needed), we move into the production phase. This phase include the fabrication of the signage or graphics, and includes any prototypes, color samples, or other interim checks that may have been specified. The actual installation step of the process is a critical final step. 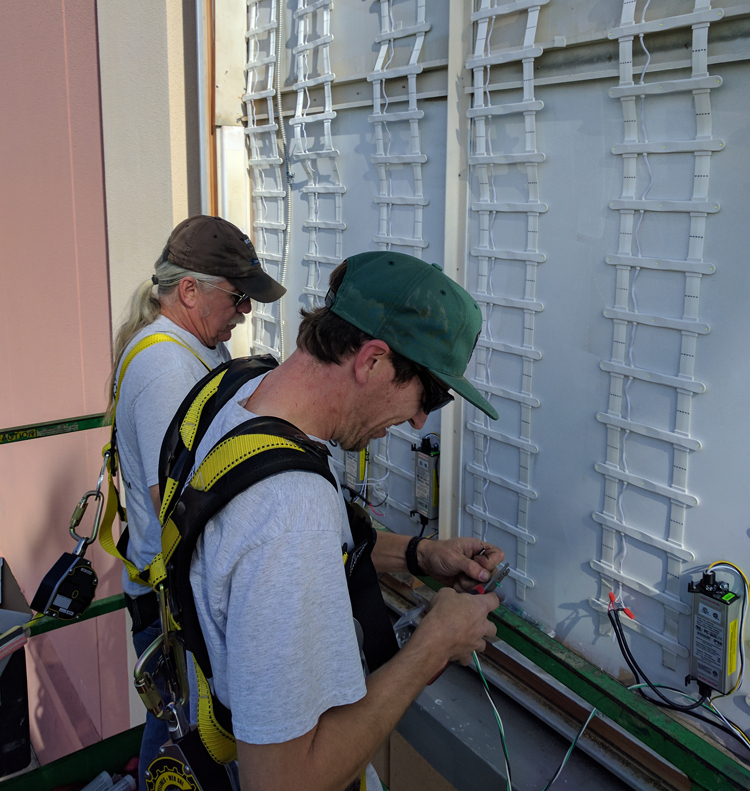 Numerous considerations apply, related to building elevation and access, electrical codes, permit requirements, and of course adherence to all applicable safety and engineering requirements. Our installation work is done by our own employees, enabling us to fully stand behind the quality of the work and the project timeline. And of course, we are fully licensed, bonded and insured. Interested in starting the process of getting the signage and graphics solutions that will enable your business to Stand Out. Be Noticed. Get Results? Click here and a project manager will contact you.